Wisconsin Pet Care is the highest-awarded and rated Dog Walking and Pet Sitting service for the city of Milwaukee and the Third Ward. 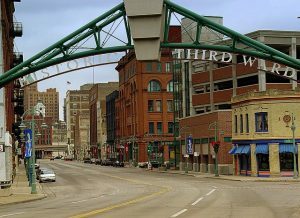 Located in Milwaukee County, the Third Ward is filled with a hip, young, millennial crowd and empty nesters who live in converted loft spaces and new condos. Residents take their dogs to the Summerfest grounds and walk along the shores of Lake Michigan. If you have a dog, this is the place to live because so many 3rd Ward businesses are pet friendly. Let us take your dog for a nice long walk around the area to take in the sights, smells and sounds! Why should you choose Wisconsin Pet Care? As in real estate’s “location, location, location” – ours is “reputation, reputation, reputation!” Our professional team of dog walkers and pet sitters are bonded, insured, pet first aid and CPR certified, and have been thoroughly background checked. We will love your kids as much as you do! Ready to Book Dog Walking and Pet Sitting in Historic 3rd Ward, 53202?